Medical technology requires a special degree of efficiency and precision in the production of parts intended for medical purposes. At the same time, the industry faces increasing demands due to the competition from the global market and increasing customer expectations. To meet the market demands, it is vital to keep producing high-quality products with flexibility and within a short delivery window. To succeed, manufacturers need to use their resources efficiently and design reliable operational processes that support their production. 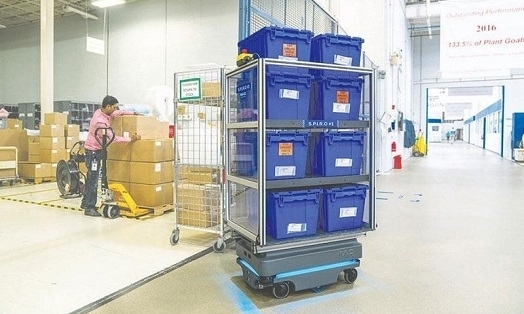 Autonomous mobile robots (AMRs) are frequently used precisely for this purpose, as the dynamic and flexible technology enables companies to automate their internal material transportation in an efficient and cost-effective way. Productions in the pharmaceutical industry in particular are often characterized by being dynamic and agile. In-house transports are constantly taking place: semi-finished goods move from warehouse to production lines; finished goods from production lines to warehouse, and items between departments. Skilled workers spend much of their day just moving parts from A to B, and usually they must interrupt their actual work to do it. This leads to unnecessary standstill on their machines, which means a great loss of efficiency. AMRs offer enormous potential for optimizing the intralogistics. The AMRs are flexible, easy to program, and collaborative, features that fit the modern production processes particularly well. While traditional automated guided vehicles (AGVs) can only be operated using physically mounted guides like magnetic stripes or rails, AMRs provide a simple and quickly deployable alternative. With built-in sensors, cameras, and sophisticated software, AMRs can identify their surroundings and take the most efficient route to their destinations, safely avoiding obstacles and people. This allows the robots to work safely next to humans while increasing productivity. The collaborative AMRs are often very user-friendly and can be programmed without any prior programming experience. Connected via Wi-Fi, the employees can easily access the robot interface, usually from a computer or a mobile device. The intelligent navigation system and the user-friendliness of AMRs make the integration of AMRs fast and keep the costs down, ensuring a fast ROI of usually less than a year. This reason alone makes it easier for companies of all sizes, even those who previously thought a mobile automation solution was too expensive or too difficult to integrate, to decide to implement mobile robots. American surgical instrument manufacturer, Argon Medical Devices, is an example of how manufacturers in the pharmaceutical industry benefit from using mobile robots. In its facility in Wheeling, just outside Chicago, an MiR200 robot from Mobile Industrial Robots (MiR) transports materials between production and the warehouse under clean room conditions. As a result, the company has optimized its internal material flow and workflows by freeing staff resources for higher value activities. Before introducing an MiR200 to the facility, the company spent countless man-hours on in-house transportation tasks, especially because the clean room employees must wear gowns, hair nets, and safety goggles, and then remove them any time they are outside of the clean room transfer area. Because gowning and ungowning wasted valuable time when employees needed to transfer material to the warehouse multiple times each day, material was batched for a few pick-up times per shift. However, this impacted production flow. With the MiR200 robot, productivity has improved dramatically by allowing warehouse employees to stage materials, load the robot with material for multiple departments, and send it on missions to deliver the material automatically in real time. Automating material transport through these collaborative robots helps Argon Medical compete in a high-cost labor market, while preserving jobs for its skilled long-term employees.Danish Elos Medtech Pinol A/S, one of Europe’s leading development and production partners for medical technology products and components, has also optimized its intralogistics by using mobile robots. At the facility in Denmark, an MiR100 robot from MiR is driving almost eight kilometers (five miles) a day to distribute components for further processing between production lines—a transportation tasks previously done by employees. "Staff members who normally had to transport goods for further processing in other departments can now place them on the MiR100 when it passes on its bus route," said Per Hansen, a developer at Elos Medtech. "This means they can avoid downtime and interruptions and continue processing the goods in their own department. ”The automation of in-house transportation can be an important element for medical device manufacturers to remain competitive in a global market, reduce costs, and increase efficiency. AMRs that work safely next to humans open new opportunities because they can handle repetitive, time-consuming transportation tasks and always work reliably. Thanks to the high level of flexibility, and easy commissioning and operation, companies like Argon Medical and Elos Medtech can optimize their material flow in a simple and cost-effective manner, ensuring a future-proof production of medical devices.